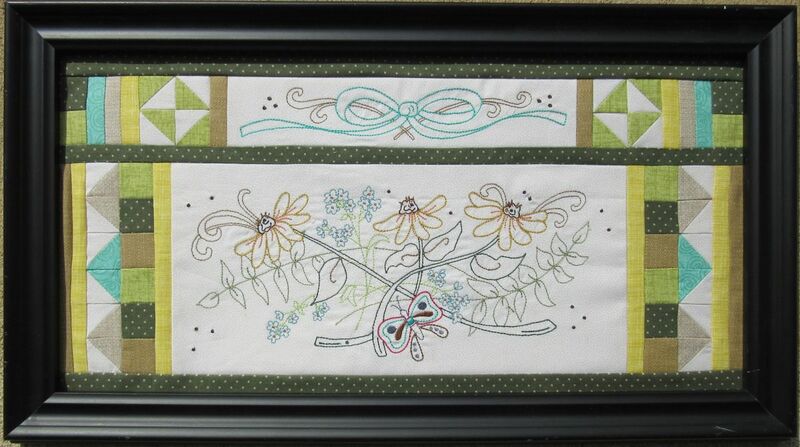 Enjoy using your embroidery machine to stitch this wonderful artwork in several sizes. It would make a beautiful small quilt or table runner too! Small flowers 3.33" x 8"
Med. flowers 4.20" x 10"
Large flowers 5.20" x 12.50"
Whole bow small .75" x 4.80"
Whole bow med. .94" x 6.05"
Whole bow large 1.18" x 7.50"
Whole bow XL 1.50" x 9.50"
Large 4 panel size as shown including piecing 8 1/4" x 39"
Here is another snowman pattern using machine embroidery that you can love! 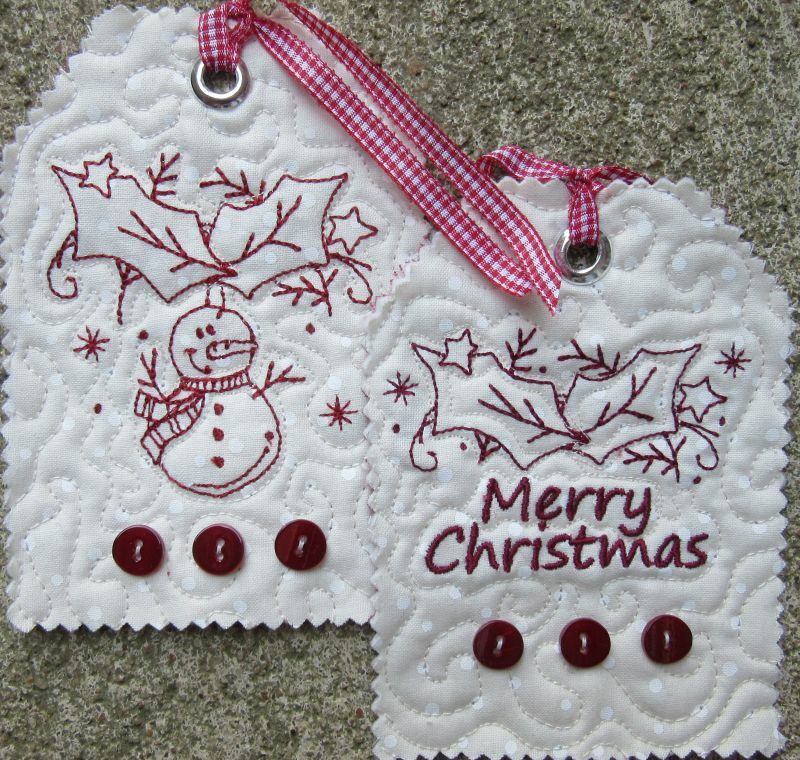 This is a quick and easy embroidery project that includes several size options. You can piece the large project together with no multi-hooping. The design is also included as a whole in 3 sizes for multi-hooping. Small hoop size 4 1/2" x 4 3/4"
Large hoop size 5 1/4" x 6"
Small 2 1/4" x 6 7/8"
Medium 3" x 9 1/4"
Large 3 3/4" x 11 1/4"
Everything looks better under glass! 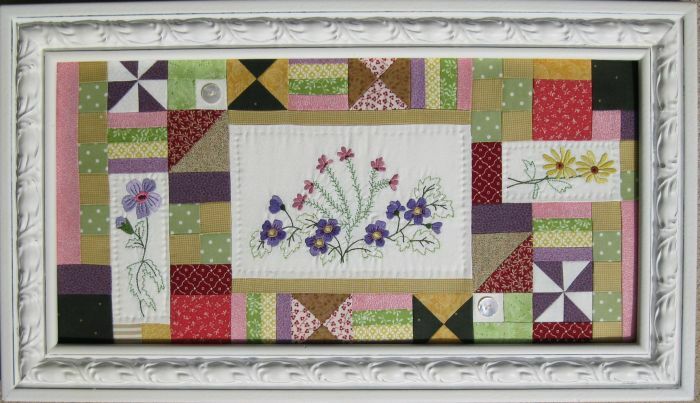 Use your embroidery machine to stitch these lovely wildflowers and enjoy them all year long. A small and large size of the center flower design is included. 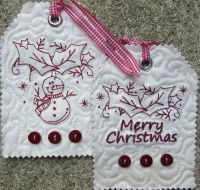 Each design stitches out in an outline stitch of a fill stitch. Small center flower measures 2 7.8" x 4 7/8"
Large center flower measures 4" x 6 7/8"
Left flower measures 1 3/4" x 4 3/4"
Right flower measures 1 3/4" x 3 3/4"